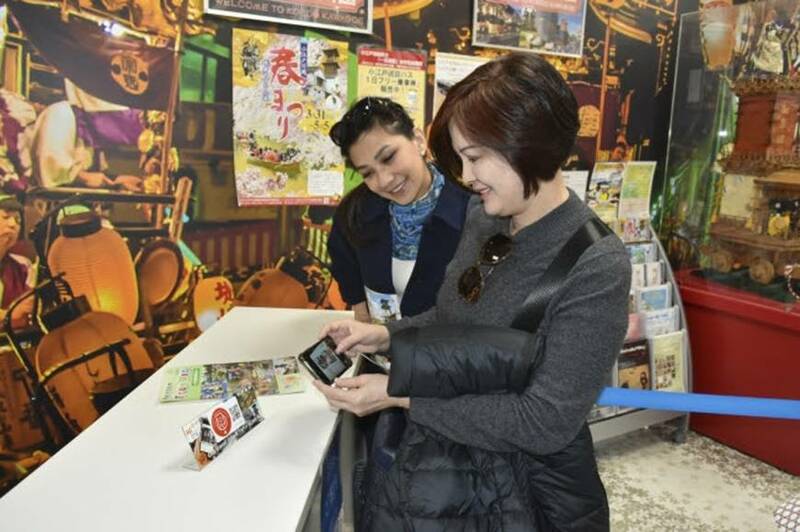 A tourist scans a QR code on Monday on an Orix Corp. travel information placard placed at the Kawagoe City Tourist Information Office in Saitama Prefecture. | ORIX CORP.
Orix Corp. officially announced the launch Wednesday of its new free information service for foreign tourists that enables the accessing of local information websites translated into other languages through the scanning of specially designated placards using smartphones. By holding a phone or a similar device equipped with the Near Field Communication System, which is downloadable, over a placard or by scanning a QR code via a camera, tourists can view local travel information websites provided by the municipalities in the languages set up on their own personal devices. If there is no translated content in that language, an English translation will automatically be displayed. English, Chinese, Korean and Thai are currently available, said Orix spokesman Ken Matsumura. “With this service, (foreign) tourists can have access to the best local information, and will not need to search ‘places to see’ on Google all the time,” said Tetsuya Fujii, another Orix spokesman, at a news conference held in Tokyo’s Minato Ward. Orix began the service in February in 26 prefectures and municipalities from Hokkaido to Kyushu, with each municipality having around 50 to 100 placards installed in travel information centers, accommodation facilities, tourist spots and transportation sites. They will be expanding the number of locations to around 70 to 90, with 5,000 to 10,000 plaques being in place by September. In addition to translated local information, tourists are able to check the locations of lockers, Wi-Fi hotspots, ATMs and rest rooms with the aid of Google Maps. “We focused on providing a service that would minimize the stress foreign tourists feel during their stay in Japan,” Matsumura said. “The language barrier is among the most frustrating problems for foreign tourists, and to make them want to come back to Japan again we need to help them overcome it,” he explained. Orix said it would also benefit from advertisements shown on the translated websites. In a bid to prepare for the 2020 Tokyo Olympics and Paralympics, the Japan Tourism Agency set a guideline in 2014 promoting multilingual signage in Japan with an aim to create a foreign-friendly environment. Still, a large number of foreign tourists seem to be struggling with language issues. A survey conducted by the agency last year asked 3,225 foreign tourists at six airports in Japan about their views regarding language and communication difficulties they faced during their travels. The results showed that more than 70 percent of the tourists found multilingual descriptions or signs at such locations as castles, shrines, and temples to be insufficient or inaccurate. The figure was greater than at other places such as railway stations, accommodation facilities, restaurants, and rental shops. The number of foreign visitors to Japan hit a record-high of 28.69 million last year, a 19 percent increase from 2016, and on track to reach 40 million — the 2020 goal set by the government.